A quick question , unrelated to your ride report... Have you riden a Kawasaki KLE500 Chris? If so , how you rate it ? Glad you like the RR. Sorry, never owned or ridden a KLE. However, things I read on the HUBB suggest it's a good bike. Awesome pictures... I really want to visit that region asap, as (especially mongolia,as I've read) is changing fast. Did you have issues with your bike being too heavy? Or was it manageable enough? The AT will do just fine, assuming the suspension is up to it (my TA has progressive fork springs and a modified -stiffer- shock), aggressive tyres (I was running Pirelli MT21) and your riding ability. At home in the UK I ride off pavement quite a bit on a drz400 and have also done some off pavement touring on it in Moroc and Romania. I also borrowed the same model for trips through Baja and CDT and western TAT in Mexico/USA. There's pictures and videos on my website . So what I'm saying is: it helps riding a shed in the dirt if you've got a bit of experience. 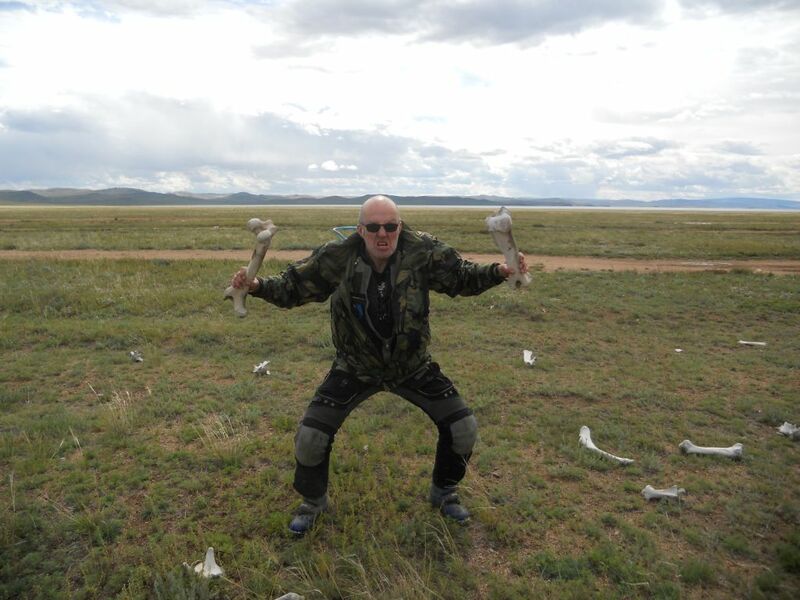 I saw the bike again in Ulaan Bataar, so he and his chums made it! He rode (was pushed.... according to his mate... ) the southern route, which allegedly is "easier" than the northern or middle routes. I'll try to post the Mongolian section of this RR soon. PS. Did your bike arrive OK back in NL? Any problems with the freighting? One of my options for this summer is to freight the shed back from UB to my parents' house in Germany. Apparently i paid for shipping to germany but the bill said holland somehow . So i went to pick it up and had a few beers at a friends place along the way. I know your bike doesn't have the looks but is it still valuable enough to ship back? Heres a couple more maps of my route between Almaty and the Russian/ Mongolia border at Tashanta with one or two comments of what happened (or didnt) en route. Thanks for the paneuropa.de shipping info. The bike value doesn't really justify shipping cost, but I also have to consider the "opportunity cost". And the bike does give me some good memories (Cliff nightmares excluded!). My 2 options are freight from UB to Germany like you did or put it in a truck/train from Yakutsk/Magadan to Moscow (I fly there) and then ride home from Moscow. Which option I choose depends a lot on timings. There's also a 3rd option that is to ride the bike from Magadan back to Tajikistan to ride the Pamir Highway that I missed in 2012 and then freight home from Kyrgyzstan, but this is the least likely option at the moment. nice RR, those are the regions we spent our last 4 summer holidays and we are still thinking of it for next summer. Where did you want to go, when following the Chon Kemin valley? Just turning back or is there a pass, that is rideable? We met some Russian cyclists who had cycled the valley east to west. Our plan was to cut south (having traveled west>east) towards Lake IssyKul. The route we ended up on had seen very little traffic, and definitely none since the previous winter. It was in very poor condition. The Cliff incident then occurred and we all headed back out to the main north/south Bishkek/IssyKul road. How are your Morocco/Dakar plans going? I remember your nice hospitality and help fixing my DRZ when I passed through Brasov. I'll look you up when I next visit Romania. I've been sectioned, but they're letting me out next week, so maybe I'll be able to publish a bit more stuff then.
" I've been sectioned, but they're letting me out next week"....do you think that maybe a little early..
Ok, maybe the madness set in a little earlier than me tasting human flesh. It wasn't the depth of the water that was the problem, it was the speed it flowed at. I ended up on my ar$e in a shallower bit and the bike was trying to fcuk off down-stream with out me: That's close to 200 kg of bike plus luggage, plus 30 litres of gas lying on its side.... It had been raining for 36 hours previously and this was my first experience of a flash flood: I know what to look out for next time. Again, apologies for the late installment of Brightys capers out east. Welcome to Mongolia. Heres the forecast: The weather was mainly Shiite with some Sunni intervals. This was allegedly the worst summer in terms of rain for many years. For us it was changeable. Everything from sun to cloud, rain storms, hail, sleet, snow, me and Moritz had it all. I ended up riding with Moritz, whom I had already hung out with in Barnaul after it turned out that that Germans get on even less with les escargot munchers than the Pommies. We got on well, I think. I crossed the border from Tashanta to Tsagaannuur. Or rather, I tried to. I nearly never made it into Mongolia. I had a visa, but it wasnt valid! Why? The Mongol matie in London forgot to sign it. So 6 hours at the border, with the head of the local immigration office uttering the words: It is not the problem of the immigration service of Mongolia if the consular service of London is incompetent. I was very lucky to be able to buy a new visa at the border. Mongol rally cars at the border. Theyd each be at the border for about 36 hours. The time it took to process their import papers. In Olgi we saw this ridiculous shed. He made it to Ulan Bataar via the southern route. His mates had to do a lot of pushing. Another pic of this monstrous beast. Not only did he buy the entire bling catalogue, but he could carry about a 1000 catalogues. Myself and Moritz rode to Olgi then cut north to Ulangom. Theres lots of horses in Mongolia. And horse men. They were friendly enough. Here we still had some Russian food. It tasted great. Mongolian food varies between sh!te and non-existent. Just as sh!te as the Korean H!te beer. At a junction from the dirt road and the pavement, not that far from Ulangom we stop for comfort break. There I spot Ernie and he joins the trip. I suppose he wont be thieving stuff again in a hurry, nor meeting any women, with his now, Neanderthal looks. and when youve really messed up, how to sort it. Such a fantastic RR, thanks or taking the time to photograph and write all this up for us Chris! Hope you're well. Always looking for an excuse to head Stateside. I hope to be there sooner than later. Let me know if/when you're in the UK. There's great biking here too.